Homebuyer | Owner Damp Surveys? Damp Experts, independent of contractors, 11 years professional experience, 2,000 properties. Video survey. Most surveys take place when the buyer cannot see the survey in action. We compile a summary video survey in addition to the report. Diligence. Our business depends on accurately identifying the cause of dampness every time. We can spend hours searching through clues and data using a range of devices from; infra-red, radio frequency and conductive damp meters, hygrometers, drain CCTV video inspection, borescope, chemical analysis etc. We ask to see the neighbours’ wall if the party wall is damp. Buyers – mortgage lender guarantee. Our reports are accepted by lenders as an expert authority. In the very rare instance that lenders do not accept our findings, we will refund the fee. Vendors – buyer guarantee. Buyers are not always easy to convince. We offer to return to the property and explain our report. If the buyer is still not convinced, we will refund the fee. Rising Damp Guarantee. In addition we volunteer a full refund if we identify rising damp. No need to ask for it. Rising Damp is so rare in London, that we would be delighted to find a genuine example, see definition of Rising Damp. In addition to our offer to home buyers, we offer to fix damp during the survey – with the homeowners consent. We can fix most forms of dampness for no additional charge during the damp survey. For example if rising damp is the cause of dampness, we can drill and inject DryZone damp proofing cream into the damp wall for no additional charge. How much should a damp survey cost? The real cost of a Damp Survey is the cost of not finding and treating the source of damp! What differentiates Damp Surveys Ltd? Independent from contractors. Our only income is from Damp and Timber Surveys. Extensive survey. Most surveys take 1 to 2 hours. We look at damp walls from every angle and if there are any doubts, will ask to see the neighbour’s side of the wall. After all rising damp rises evenly on both side of the walls. We take a holistic approach, tracing damp back to it’s root cause. Time of your choosing. We work 8AM to 8PM and at the weekends. We make a point of being on time. Suitable qualifications with the Property Care Association. Satisfied customers. Simon Hichens has given professional advice on over 2,000 properties since 2007. Simon undertakes expert witness reports (price dependent on complexity) for court case and dispute resolution. We charge a fixed survey fee of £199 (no VAT payable). You are welcome to email images of your damp and call us for free consultation. 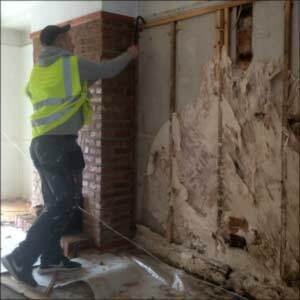 Damp proofing against rising damp, condensation, penetrating damp and leaking pipes is almost always free to solve. 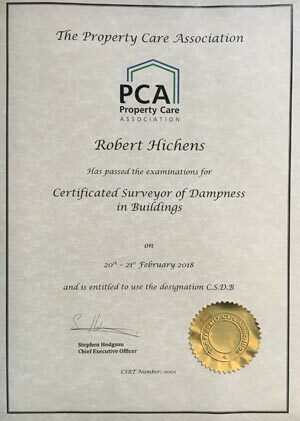 A Certificated Surveyor of Dampness in Building; after passing written and orals exams by the Property care Association (a trade body for the damp Proofing industry). By relevant experience evidence by membership of the Institute of Specialist Surveyors and Engineers. Robert Simon Hichens has both qualifications. Your peace of mind is our goal. For you to be satisfied that the property will be properly protected against damp now and into the future, not just a short term fix. Our charge is £199 (no VAT payable) – the average savings by taking our root cause approach is £7,500 – but we have saved over £35,000 of unnecessary, damaging treatment in the past (arguably £100,000 when including past failed attempts using chemicals). Here are examples of different types of damp and timber report.